Unlike many of the other Italian girls living in New York City Angela sincerely enjoys going to school. She and her family came to America from Scicily and she has been going to school for four years, improving her English and learning all sorts of other interesting things. Now that she is fourteen though she has to give up going to school and find a job. With her father often unable to work because of an old injury the family need Angela?s wages very badly. 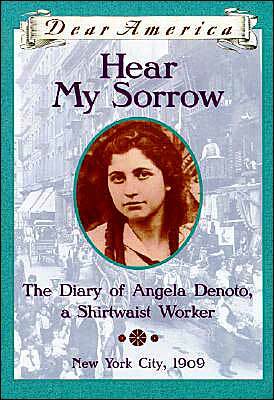 Soon enough Angela finds herself working in the same small shirtwaist shop as her sister Lucia. She has to accustom herself to long gruelling working hours six days a week in a room filled with noise, dust and lint. She has to accept being paid very little for her work, having to pay for the needles she uses, and having to pay for the locker where she keeps her hat and coat. She is allowed a half hour break for lunch, she mustn?t talk as she works, and she has to tolerate having her boss peering over her shoulder all the time. There are girls in the shop who are not willing to accept these conditions without a fight though. One of these is Sarah, a spirited Jewish girl who is determined to do all she can to improve the working conditions in the factories and sweatshops in New York. Angela cannot help believing that Sarah is right and that workers should have more rights but at the same time she is afraid to rock the boat. Her family needs her wages; what if she were to loose her job? What would happen then? In the end Angela follows her heart and when a strike is called she joins the other girls and women in one of the biggest strikes of its kind in American history. Though the strikers do not get everything they hoped for they do have some successes with the small shop owners. The big ones however, like the ones who own the Triangle Shirtwaist Factory, agree to only a few of the strikers demands. The workers in "the Triangle" have not been able to improve their working conditions much. How little they have achieved becomes horrifyingly clear when a fire breaks out in the factory. Angela watches with terror as girls leap from the eight and nine story windows, their hair and clothes on fire. Is her sister Lucia one of the girls trapped inside the building? This moving and fascinating work of historical fiction gives the reader an enlightening picture of life in a tenement in New York in the early 1900's. We get a sense of the close community spirit which held the Italians immigrants together despite the problems they faced on a daily basis. Deborah Hopkinson clearly has a great deal of compassion for the struggles of the working people and this superbly researched book is a tribute to their efforts and their victories.